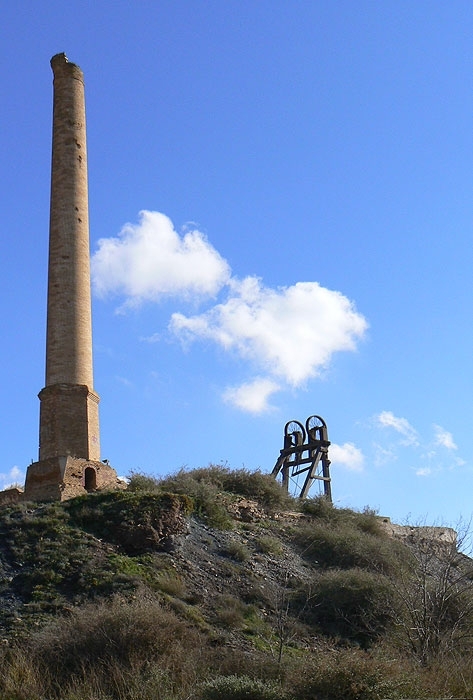 I fell in love (as only industrial archaeologists can) with this seemingly unprepossessing area of Murcia province whilst driving through it in 2008. 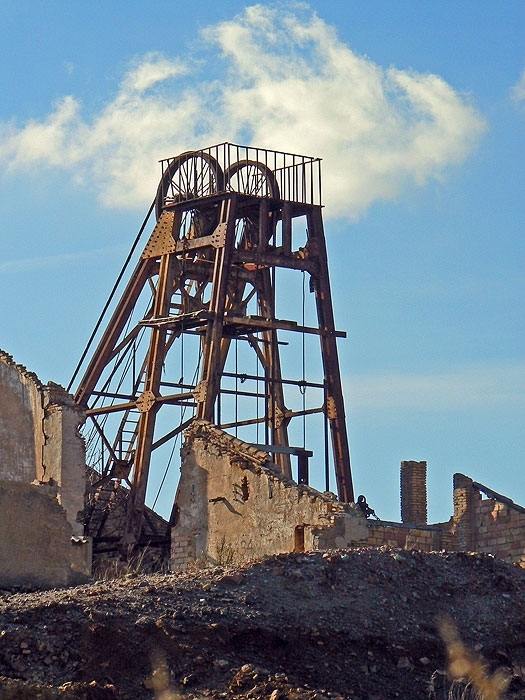 Pockmarked and scarred by mine workings and waste heaps, the landscape was peppered with the remains of scores of mines — headgear, chimneys, topside buildings and heaps of debris. Arid, mostly treeless, and often ugly, the area has been mined since before the Romans arrived to establish the centre now known as Cartagena, an attractive and interesting city that still boasts a Roman theatre. The landscape is (was?) dotted with uncapped mine shafts, each bearing a painted number. Although much of the equipment was a mix of timber and iron, the dry climate and its relative under-development has meant that much has survived. Walls have crumbled, but there was little evidence of mindless vandalism. On the coast is Portman, notorious for the offshore "dead zone" created by the tailings from its mines that were poured into the Mediterranean. Until recently, amongst the ruins of the mine, which ceased operations only 25 years ago, lay a train of rusting wagons, as if the driver simply turned off his engine and walked away. In the decade since I first visited the area, there has been a growth of tourist/heritage interest, and a "mining park" has been created. I look forward to returning to La Union soon, though in a way the lonely, abandoned mines and their neglected remains were perhaps more evocative of the past than today's "attractions".